The first time I saw bulgur wheat I was 21 and living in Brazil. I was serving a mission for my Church, and my companion, who was Brazilian (missionaries go two by two, and call each other companions), decided to make a salad for lunch. We ate most lunches with members–it was a daily fare of rice and beans and salad with lime–but we supplied our own breakfasts and dinners, and lunches on our “Preparation day” (our cleaning/laundry/errand running/letter-writing day). And as missionaries are on a strict budget, breakfasts and dinners had to be affordable. I’ll be honest, we usually only bought mangos, bananas and popcorn, and if we had extra at the end of the month we would splurge and buy cheese and crackers, jam, or yogurt for smoothies. For this particular meal, my companion made it extra special and bought tomatoes, cucumbers, and bulgur wheat. When I asked her what it was and how to cook it, she gave me a look that required no words (English or Portuguese) “Silly Americans, do you not know what bulgur wheat is? !”, and then proceeded to say, “It’s so simple, you just pour the amount of wheat you want in a bowl, boil a little more water than wheat, pour it over, cover it, and when it’s done, just add your tomato and cucumber.” So simple, so yummy! I am sure not all Americans are silly, but I’d simply never been exposed to bulgur wheat. Maybe I had, but just didn’t know it. You know how it goes, you’ve finally left the nest, you’re out on your own, and the whole world seems new because you’re seeing it through your own new, grown-up eyes. Anyway, I’d like to think I’m less of a silly American now, and bulgur wheat is usually in my cupboard for a quick go-to meal. Bulgur wheat is also called cracked wheat, and it’s considered a whole grain, which means it contains the endosperm, germ, and bran of a seed. And being a whole grain, it’s loaded with fiber, and also has a fair amount of potassium, protein, iron, zinc, and niacin. It’s most traditionally used to make the Middle Eastern tabbouleh salad, with loads of parsley, mint, lemon, tomatoes, and cucumbers. Bulgur wheat has a sweet, nutty flavor, and, like my companion pointed out, is super easy to make–probably the fastest whole food out there! Which I hope will make you think twice the next time you feel like you only have time to do a fast food drive-thru run for a meal! For my tabbouleh, I used what I had on hand–you are going to see me saying this A LOT. Use what you have on hand! That doesn’t mean if you are out of curry powder to go ahead and substitute paprika, because that’s what you have on hand. Spices are one thing, and veggies are another. 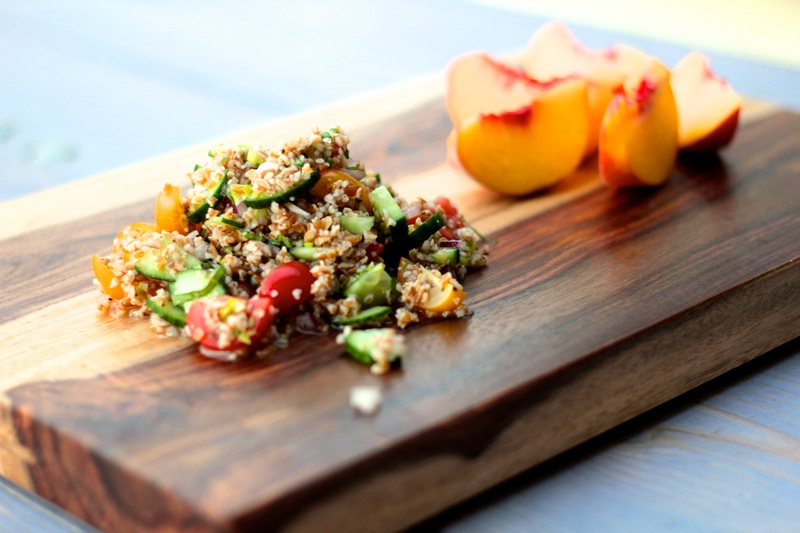 The purpose of this salad is to add some fresh crunch to accompany the bulgur wheat, and some citrus for zip. 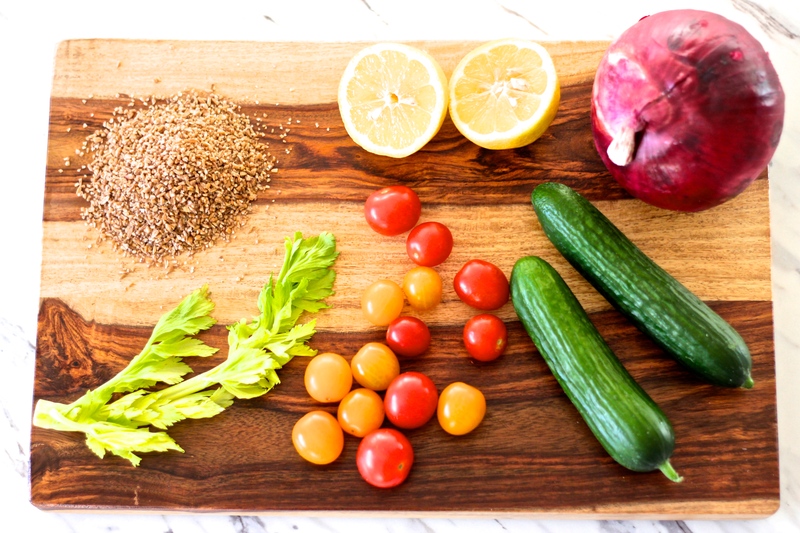 Experiment with flavors you like–I had tomatoes, cucumbers, red onion, celery, basil, and lemon. If you have green pepper, red onion, olives, feta cheese, parsley and lemon, use that. Or cucumbers, tomatoes, red onion, jalapeño, cilantro, and lime, use that. It’s a super simple salad that can take on many different flavors. And on the side? I had fresh farm-stand peaches. Tasted just like summer! 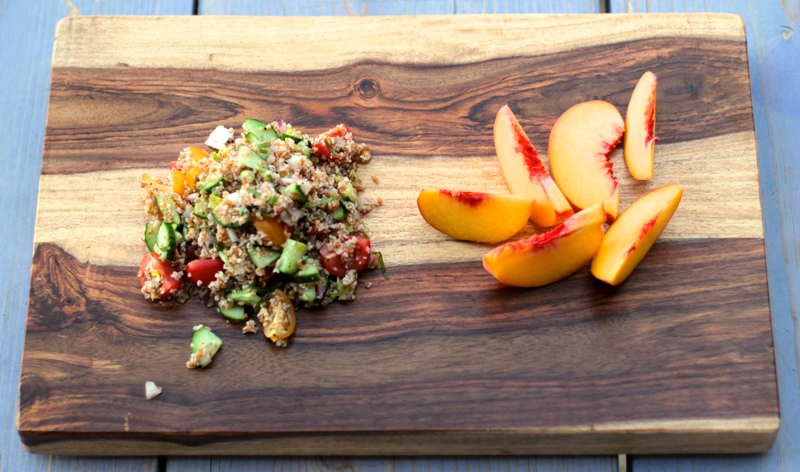 The purpose of this salad is to add some fresh crunch to accompany the bulgur wheat, and some citrus for zip. 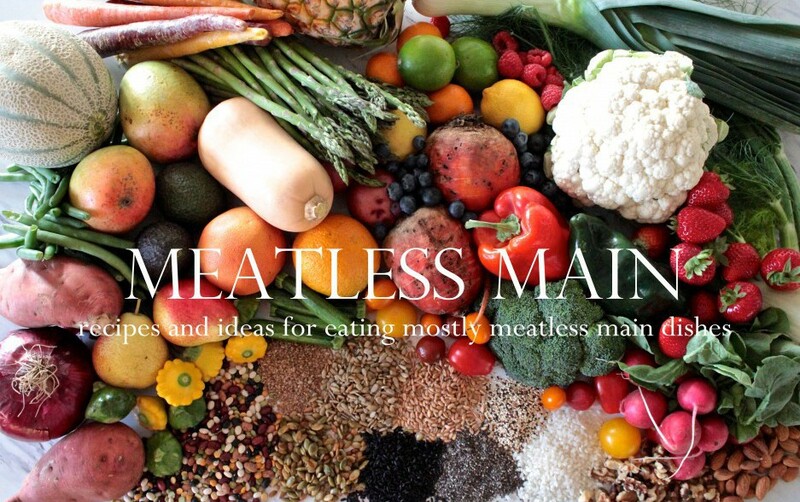 Experiment with flavors you like–I had tomatoes, cucumbers, red onion, celery, basil, and lemon. If you have green pepper, red onion, olives, feta cheese, parsley and lemon, use that. Or cucumbers, tomatoes, red onion, jalapeño, cilantro, and lime, use that. It’s a super simple salad that can take on many different flavors. 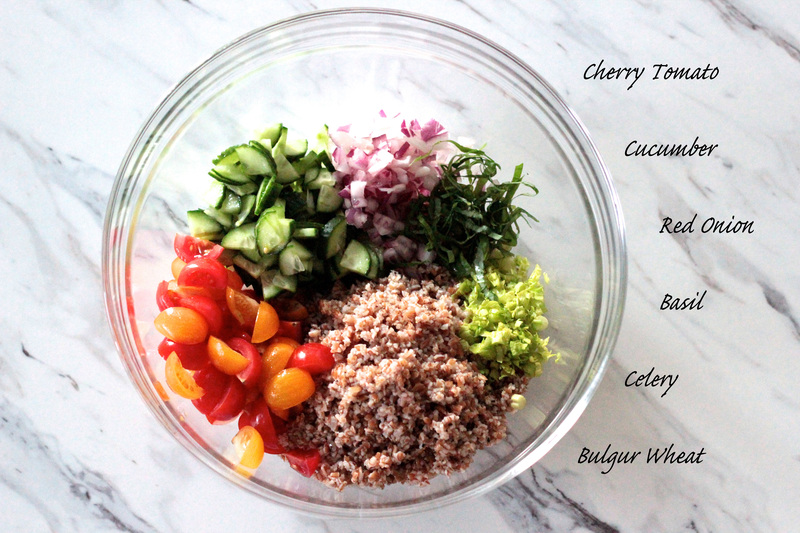 Place the bulgur wheat in a medium bowl with a lid. Boil the water and pour over the wheat, then cover and let sit for 10-15 minutes. While the wheat is “cooking”, you can get the rest of your ingredients chopped and diced. Place them all in a large bowl. When the wheat is soft, add to the large bowl with your veggies. Add the lemon zest and juice, sprinkle salt and pepper to taste, and a drizzle of olive oil. Stir and serve. Serving suggestions: You could just eat it as is, with a spoon, or scoop it up with crackers; Put it in a pita with spinach for a pita sandwich; scoop out a tomato and fill it with the tabbouleh for a “stuffed tomato”. Next > Nothing Like a Waffle Celebration! That looks amazing! I’m going to go pick up some bulgur wheat tomorrow! Tabbouleh is one of my most favorite things in the whole world!